A division of Tucows, Ting is on a mission to bring a completely new approach to mobile phone service. The company provides extensive customization and flexibility for the customer’s monthly phone bill. By separating out and billing minutes, data usage and messages separately, Ting offers a level of transparency, usability and savings that other mobile service providers are hard-pressed to match. Ting’s customers only pay for the usage levels they actually hit each month - with straightforward rates and no penalty pricing for overages. We increased our conversion 22.5% during the first thirty days. Like Amazon, Ting’s customer-first brand prioritizes customer service. “We aim to answer all of our support calls within just a few rings, and you’ll always get someone who cares and who is happy to help,” said Scott Allan, Director of Ting. After integrating Amazon Pay, they are now able to extend the trust and convenience that Amazon provides to further enhance the customer experience. “The product management and engineering team at Amazon was invaluable when we were trying to wrestle with how to best handle integrating some of the unique peculiarities of our business and industry with Amazon Pay,” said Justen Burdette, Product Manager for Ting. After launching Amazon Pay, Ting saw an immediate, positive jump across all of their key business metrics. Most notably - their conversion rate increased 22.5% over their first 30 days. But that wasn’t the only big jump that Ting experienced. 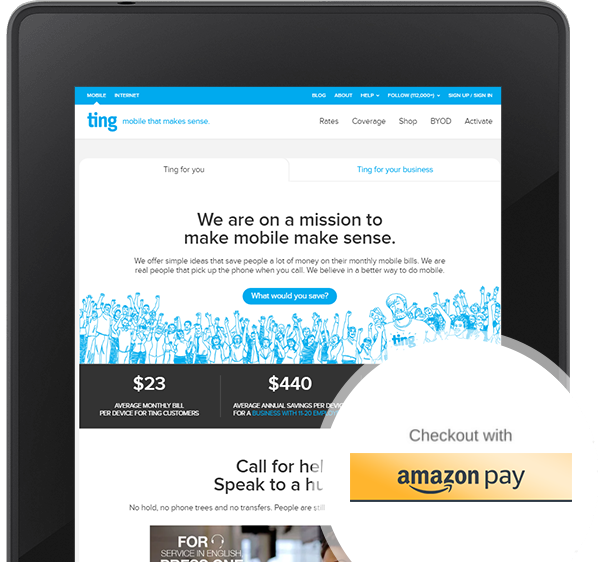 New customers to Ting quickly adopted Amazon Pay as their preferred method for paying for their recurring billing. 34% of new Ting customers selected Amazon Pay' automatic payments feature for their recurring billing, second only to Visa. Over the same time period, customers who paid with Amazon averaged a higher order ticket for their device purchases. Amazon customers’ average ticket for device purchases was $245.31, 30% higher than the non-Amazon average of $188.75. As a customer-first brand, Ting figured that adding Amazon Pay was good for their customers. The positive customer reaction was overwhelming - and it even took Ting by surprise. “We knew customers would be pleased to have the Amazon Pay options, but we honestly didn’t expect anyone to take time out of their day to tell us how happy they were about it - but many did,” said Justen. Amazon’s A-to-z Guarantee is another great benefit for Ting’s customers, especially those who are brand-new. The company acknowledges that especially in the mobile space, it takes time to earn the trust of customers that so many other carriers take for granted. While many of the company’s new customers come through word-of-mouth from friends and family members, the A-to-z Guarantee provides reassurance for new customers who sign up. We saw a 30% higher average order value with Amazon Pay than other payment methods. Amazon’s A-to-z Guarantee helps protect customers when qualified purchases are made on third-party sites through Amazon Pay. The A-to-z Guarantee ensures they will receive their order in the proper condition stated, on-time and that they are always charged the right price. Should something go wrong with an order, Amazon also ensures the customer gets refunded the proper amount as well. When asked about the company’s experience with Amazon Pay, it’s clear that Justen, Scott and the rest of the Ting team are very pleased. Flawless is the best word. Awesome would be another. And our customers are loving it. So it’s been a truly great experience, and we’re looking forward to more and more of our new and existing customers discovering the new Amazon options.” said Scott. Ting has big growth plans over the next three to five years. Among them, they are focused on making sure they protect the service, experience, and value that the company provides, and they are also working on new ways to bring even more convenient and reliable service to their customers. Amazon Pay looks to play a big role in helping Ting take the next step in delighting even more of their customers and exceeding their business goals.